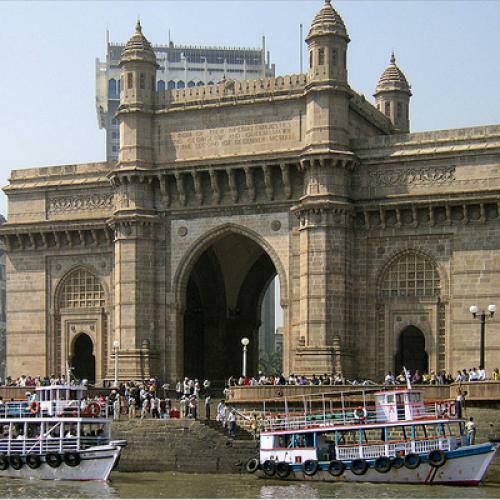 UNLIKE NEW DELHI, India’s capital, Bombay is not a city rich with history. Unlike Calcutta, whose cultural icons include Rabindranath Tagore and Satyajit Ray, Bombay houses (in ostentatious bungalows) the stars of barely-watchable Bollywood melodramas. Bombay makes news when terrorists attack the city (as they did most recently in November 2008), or when Mukesh Ambani, the wealthiest man in India, spends a billion dollars to erect a skyscraper for himself, or when the symbol of its squalor, the slum, provides the backdrop for an Academy Award-winning film. But Bombay is India’s most populous city, and it remains the most attractive destination for Indians from outside the metropolitan area. Bombay is also India’s face to the world—the star of the East with its face to the West. It is the energetic port where people come to seek their fortune: the girl who wants to be a Bollywood star, the couple that wants to escape the social pressures of caste, the boy who wants to get on a ship and see the world, the trader who wants to prosper. It is India’s Manhattan: if you can make it there, you can make it anywhere. It has glamour, glitter, and money—lots of money. And it is now under siege from people both inside and outside the country who wish to see India’s multicultural democracy fail. Gyan Prakash chronicles Bombay with verve and panache in his new book. Prakash was not born in the city; his interest and affection developed later. He approaches Bombay like a cultural anthropologist. He looks at the city’s familiar landmarks—the Gateway of India, the docks, the Marine Drive—and sweeps away the layers of accumulated dust. At first his narrative seems disjointed: he pieces together scraps of information from tabloids, century-old novels, popular history, poetry, billboards, advertising posters, and serious academic works—with the enthusiasm of an eclectic collector. Each episode he details provides a glimpse into the city’s past and its essence. And just when you question if there is a coherent narrative, he brings you to the beach by the waterfront, asking you to trust him, and makes you look through the hole in a box. And then he gives the box—the bioscope—a shake, and it becomes a kaleidoscope, the images find their place, and a mesmerizing maximum city emerges. Bombay, as Prakash explains, is the result of reclamation—it became a city when the British joined the seven islands they received from the Portuguese as dowry when Catherine of Braganza married Charles II in the seventeenth century. A large proportion of the city is made of reclaimed land, and one consequence of sustained reclamation is the severe erosion of the coast northward, exposing buildings to the fury of the sea. The cost of reclamation is high, and only expensive apartments can be built there; as the poor need a place to live, slums proliferate, sharpening social inequity. Prakash introduces us to the city’s icons, like Sir Jamsetjee Jeejeebhoy, after whom the city has named a hospital and an art school, but reminds us that he made his fortune trading opium. Bombay was, and remains, a capitalist city, but the commodity it traded freely in its early days was the one that made Jeejeebhoy’s name. The city’s merchants were eager to erect textile mills for a burgeoning international demand, and to produce the cloth they needed cheap labor. The workers arrived from the hinterland; they lived cheek-by-jowl in hovels. Diseases spread, sparing the colonial masters, but the city found ingenius ways to survive amidst Dickensian filth. The city needed to grow, and it did so by devouring land from the sea. Prakash then discusses the social realists—Sadat Hasan Manto, the writer who later migrated to Pakistan, and Mulk Raj Anand and Khwaja Ahmed Abbas, the leftists who tried to give the city a progressive hue. Some of those writers penned the scripts of Bollywood. Life imitated art, and art absorbed life. In a memorable section, Prakash recounts the story of the tabloid Blitz, which fought a long battle to exonerate a dashing naval officer who killed his wife’s lover in a crime of passion. Its campaign succeeded, and the jury exonerated the officer, leading to the eventual end of trial by jury in India. But rousing the masses through the power of the press is a dangerous business. As Prakash reminds us, in the 1960s a cartoonist-turned-politician called Bal Thackeray used the wit and vitriol of his Marathi-language tabloid, Marmik, to create a divisive political party, Shiv Sena, whose view of the city as a home for native-speakers and Hindus came at a high price. But what ultimately may tear the city apart some day is the threat within, the Shiv Sena. In his novel, The Moor’s Last Sigh, the Bombay-born Salman Rushdie writes: “Those who hated India, those who sought to ruin it, would need to ruin Bombay.” The people he had in mind were the politicians whom Thackeray nurtured. The Shiv Sena has used thuggish force to attack communities, businesses, and ideas that it abhors. The city is littered with examples of businesses changing their names, altering their recruitment practices, and acquiescing to the whimsical demands of the party, and its rival off-shoot, Maharashtra Navnirman Sena (the Maharashtra Re-creation Army). Most recently, Thackeray’s grandson went to meet the vice-chancellor of the city’s premier university and remarked that he was annoyed that the university had included the Bombay-born Canadian writer Rohinton Mistry’s novel, Such A Long Journey, as part of its literature syllabus, since it ridiculed his political party and Marathi culture. The vice-chancellor immediately withdrew the book from the syllabus, to the horror of many of the city’s residents. Indeed, while the city is the capital of Maharashtra, a state where the majority speak Marathi language, its capital is unique, in that Marathi is only one of three prominent languages, the others being Hindi and Gujarati. Moreover, English is widely spoken and understood in the city. In this respect, Bombay is markedly different from other cities with a dominant lingua franca: Calcutta and Bengali; Madras and Tamil; Bangalore and Kannada. The Sena’s biggest achievement was to change the city’s name from Bombay to Mumbai. The Sena’s assertive, narrow idea, was to claim the city on behalf of Marathi-speakers, reminding others that they were outsiders. A polemic has its place in newly-independent countries, and reclaiming a city’s original name is supposed to set a historical aberration right. But Bombay was not a mispronounced corruption of Mumbai, nor was Mumbai necessarily the city’s original name. Some scholars say “Bombay” is derived from Bom Bahia, Portuguese for a good bay. Mumbai is derived from the goddess Mumba, who the original inhabitants of the island worshiped. The two names coexisted happily, as Roma does with Rome, Geneve with Geneva, and Moskva with Moscow. While the city is called Mumbai in Marathi and Gujarati languages (two of the four major languages in the city), in Hindi, the city was Bambai, and in English, Bombay – all widely-spoken languages in the city. The parallel existence of its many names underscored its pluralist, cosmopolitan ethos. But by insisting on Mumbai, the Sena wanted to remind others that they were outsiders. Prakash doesn’t succumb to the rhetoric, and calls the city Bombay where necessary, reinforcing the idea of an older, more inclusive place. From Rushdie to Mistry, and through academic and popular histories, Bombay has been well served in books. That makes Prakash’s endeavor ambitious. But he has meshed the different narratives of the city, and created a hybrid blend that is entirely in character with Bombay itself. One hopes it remains that way—that it be well served in life, too. Salil Tripathi is a London-based writer who was born in Bombay when it was still known by that name, and author of Offense: The Hindu Case (Seagull, 2009) an account of Hindu nationalist intolerance of art and literature. Tranquebar will publish his collection of travel essays later this year.